I get asked so often by clients – do I get the chance to relax in the chair and be pampered as someone cuts my hair? I get my hair cut in the salon, of course, and I do enjoy it. But this makes me think: How do we all make sure we are looking after ourselves whilst we go about our busy lives? I am a stylist with lots of clients and business owner, with a family. It is life on-the-go. But I recognise that we all have our reasons for needing to stop and take care of ourselves. So, here are some little reminders from my day in the salon on making the most of what makes us happy. I enjoy helping people feel great about themselves and their hair. It is what occupies my day. But know for my clients visiting Gill Goddard Hair it is just one appointment on their calendar – they have lots going on. When they come to the salon they are often coming in from the rain, busy lives, or out shopping. Then they stop, sit down and tell us all about their kids, their family, and their holidays. They reminisce. We get to hear highlights, which is lovely. And some sad stuff too. It is real life after all. So being with us in the salon is taking a moment out of a busy life. All the girls in the salon are so vibrant and dedicated – which makes me very lucky. I know that the clients enjoy this too. Plus, being with clients I hear a lot about peoples weekends and time with their friends and family. It always strikes me that time well spent with good people is vital to being happy. 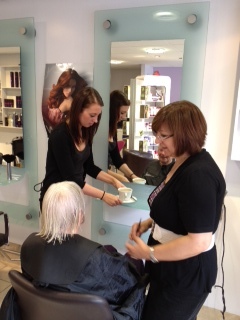 When we ask people if they want a tea or coffee while they are in the salon we are not just being polite. We are offering them the chance to relax. And enjoy ‘me’ time. At the moment I enjoy a refreshing cup of peppermint tea whilst I have my hair done but I know that Hanna prefers a Cappuccino. We cater for all South Devon tastes! Being a stylist is creative. As a business owner I have a role in educating the next generation in how to take pride in their work. Bringing along talented young hairdressers like Ashlee is a pleasure. What we all do at Gill Goddard Hair is help our clients have pride in the way they look and feel. So all round, there is something hugely positive about being proud of oneself and others.